Details of potential plans by India-based telecom Reliance Jio to launch a fixed-line broadband service leaked this week. Is the disrupter about to upend another aspect of India’s communications sector? Malaysia’s communications regulatory body reported that more than 90% of broadband connections in the country were via mobile devices in Q3 2016. And more than three-quarters of households have access to broadband internet. Sweden's telecom regulator is cracking down on mobile operator Telia for offering free access to Facebook and Spotify for customers who have topped their data limits. Google’s plan for growing its advertising audience in Indonesia is banking on a network of free Wi-Fi spots in the country. 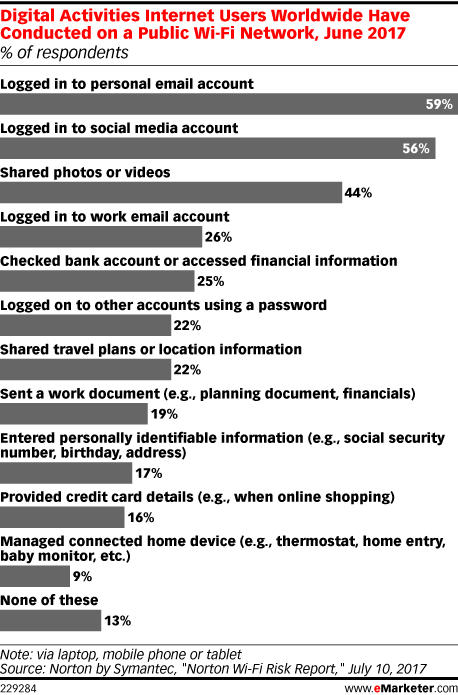 A surprising number of consumers use free, often unsecured, Wi-Fi for somewhat sensitive online activities like checking email and social media accounts. UK telecommunications giant BT's Openreach unit will become a separate company following complaints that the relationship hampers telecom competition. Verizon has made waves with its acquisitions of AOL and Yahoo, which industry experts have pointed to as an investment in advertising technology. But the company is not alone—other telecom giants in Europe and Asia have made ad tech plays as well. Matt Keiser, CEO of email advertising company LiveIntent, has been following the trend and shared his insight with eMarketer’s Maria Minsker on what’s to come. Most US adults are cautious about using free public Wi-Fi, primarily because of privacy concerns. July 2016 research revealed that nearly half of respondents believed that free public Wi-Fi was not very safe, or safe at all for that matter.